George Moffat – the oldest known Moffat ancestor, died at Coldingham, Berwickshire, Scotland in 1844 (the purple box at top right of the map below), but all that is known about his birth, is that the 1841 British Census shows he was “born in County” – the county being Berwickshire, Scotland. All efforts to find a birth record for him have come up empty so far. 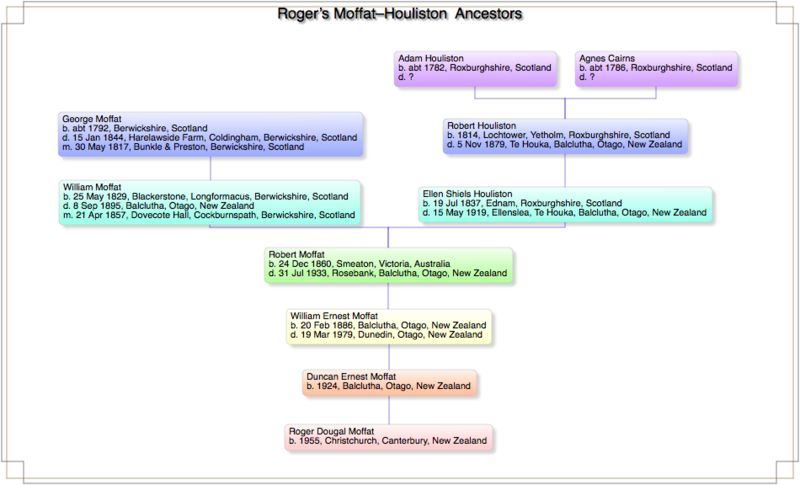 Based on what George Moffat, and his wife Isabel Clark named their children, it might be inferred from use of the Scottish Naming Pattern of children that George’s parents might have been Alexander Moffat and Margaret. There is an Alexander Moffat and Margaret Lauder who married in 1784 in Legerwood, Berwickshire, Scotland in 1874. Legerwood is just off the left side of the map, west of Gordon, but no evidence found yet that they might be “my” George’s parents. So boy – I’d sure like to meet George Moffat and Isabel Clark and ask them about their ancestors – where was George born, and who were his parents and grandparents, and were the other Moffats that were in the same vicinity as him cousins? Did he know George Moffat who was also born in Berwickshire about the same time, and died having never married in 1856. Another of my families with a persistently stubborn brick wall, is the Houliston family. While much is known about Robert Houliston, born in 1814 at Yetholm, Roxburthshire, Scotland (the lower purple box), and his wife Alice Wright, who emigrated with their 8 remaining children to New Zealand in 1860, after they got to New Zealand, little is known about their life in Scotland before 1860. (Their eldest daughter, Ellen Houliston had married William Moffat in 1857 and emigrated to Australia. They would later join the Houliston’s in New Zealand in 1862). The information we do have about Robert Houliston’s birth comes from anecdotal records in New Zealand, with no primary evidence found to date. His death record in New Zealand indicates that his parents were Adam Houliston and Agnes Cairns, but no evidence of this birth has been found yet. Andrew Houliston, a Houliston researcher in South Africa, has compiled most of the people in the world with the name or ancestry of Houliston into a single database that is online here, but no place has yet been found to join up the New Zealand Houliston group, or the other descendants of Adam Houliston and Agnes Cairns. As can be seen on the map at the left (click for lager readable map), Robert Houliston was somewhat mobile. He was born in Yetholm, Roxburghshire, Scotland in 1814 (the lower purple box). 23 years later he was in Ednam, Roxburghshire, Scotland, where his first child Ellen Houliston was born (the lower green box). 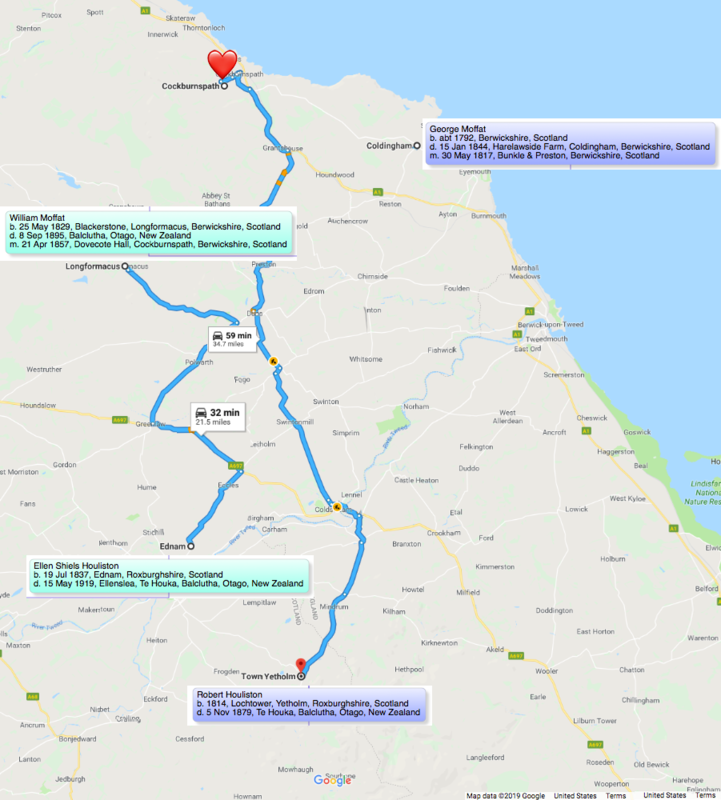 20 years after that the family was living at Cockburnspath, Berwickshire, Scotland – the red heart at the top of the map. It was here in 1857, that William Moffat married Ellen Houliston, and from where, 3 years later, Robert Houliston, his wife Alice Wright, their 8 remaining children, and a baby grand-daughter left for their journey to New Zealand. The cottage they lived in – “Dovecothall” is still standing. So boy – I’d sure like to meet Robert Houliston and his wife Alice Wright, and just ask Robert who his parents were, and where did they come from – how do they fit together with most of the rest of the known Houlistons remaining in Scotland and scattered around the world, including some 2,800 I know about descended from Robert Houliston and Alice Wright? What was it that edged them to making the decision to abandon all, and sail halfway around the world to start a new life in New Zealand? Hey, I’m looking at purchasing TNG and using it on my new website. Trying to wrap my head around what part is TNG and what part is the WordPress Blog. I see when I got to your site from the TNG website, I landed on your Home, which looks like a Blog theme from WordPress and the Genealogy tab is the TNG part. When I look at other sites listed on the TNG site, I don’t see blog features, it looks like just the TNG application. So, basically my question is, are you able to include a WordPress Blog them and run the TNG theme at the same time on your site. Basically WordPress is providing the header and footer for ALL of the pages on the site, and the content for all of the pages that ARE NOT the Genealogy page. TNG provides the content that is on the Genealogy page. Everything that shows on those pages linked from there is generated entirely by TNG. That is the TNG page wrapped in WordPress.